Kaku, at left, looking to make a play. @NewYorkRedBulls. The Red Bulls earned an emotional 2-0 win over Atlanta United to keep their Supporters' Shield hopes alive on Sunday afternoon at Red Bull Arena. The Red Bulls are now 19-7-5, with 62 points, just one point behind Atlanta (19-6-6, 63 points) for the best record in the MLS overall and the Eastern Conference. This came after the Red Bulls had already secured a first-round bye and a top-two finish when NYCFC (15-9-8, 53 points) lost in Minnesota Saturday night. 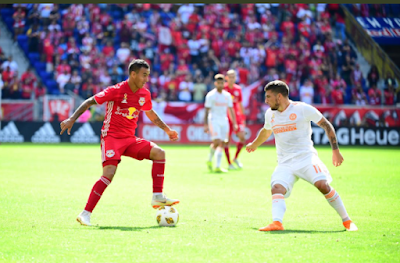 The Red Bulls' first big chance came in the 26th minute when Kaku fired a long pass from near the center circle into the box, where Alex Muyl was set to receive it. Muyl dribbled it in, and Atlanta goalkeeper Brad Guzan came out and poked it away before Muyl could get off a shot and knocked him down in the process. The Red Bulls pleaded for a penalty kick to be awarded, but because Guzan got the ball between Muyl's dribbles, they made the right call. In the 32nd, it looked like they had a goal when Tim Parker slammed one home from close range, but he was called offsides, as not only was he past the last defender, but Guzan. Soon after in the 38th minute, Kaku took a corner kick, and Atlanta's Chris McCann was called for a handball, which he was also given a yellow card for. The Red Bulls were awarded a penalty kick this time, and Daniel Royer cashed it in to make it 1-0. This was Royer's 11th goal of the season and he remained perfect in career penalty kick attempts at 6-for-6. The Red Bulls clinged to that 1-0 lead late in the second half. In the 74th minute, Marc Rzatkowski fed a pass to the goal line for Muyl, who sent a cross into the box to Parker, giving him another chance at a goal. Parker buried it for his first goal of the season, which made it 2-0 Red Bulls. This was Parker's 100th career league start, and it was his second career goal and first as a Red Bull. Red Bulls Captain and goalkeeper Luis Robles recorded two saves for a single-season franchise best 12th clean sheet. Robles is tied with Sporting KC's Tim Melia's league-best 12. Robles moved into a sole possession for eighth in league history with 98 wins. He also raised his career clean sheet total to 61. This was the Red Bulls' 13th shutout of 2018 (Robles - 12, Ryan Meara - 1), and it tied a single-season best. The Red Bulls won this one without their offensive leader, Bradley Wright-Phillips due to card accumulation. He was ruled out of this one when he took a yellow at the end of last weekend's win over Toronto. 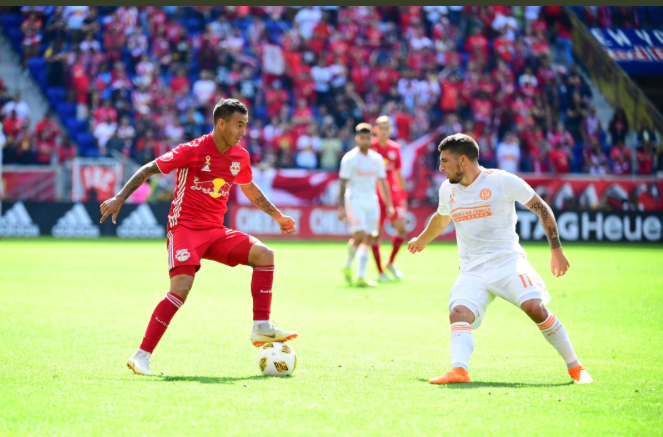 Red Bulls Head Coach Chris Armas said of winning this one without Wright-Phillips, as well as Tyler Adams, "The effort, it couldn't have been more from the opening. No, I feel really good about it. We've always talked around here for years about just being fearless and going after it and that we were most proud of from the opening whistle in a big game, this team has always shown up. It's easy to talk about it and ask for it, but then to see the guys, sort of man up, step up was impressive." Armas said of this victory proving all the stuff that can happen when you're playing against a team with so much talent, "I think, simply I think it's a result and byproduct of a philosophy that we think makes a lot of sense. And we see the roster that Dennis has built and built with young guys and some experience in there. But a clear way of playing style that when we're at our best, it can overwhelm teams and that makes you feel good. But I think that's more so what it is that we -- listen we spend money, right? So it's just, it's not just that. But it's a result and clear result of total commitment, total beyond what we do here, and I think we got to, we got tested today in a big way and we showed up in a big way." Armas said of Muyl, "I mean Alex makes plays. Look at the play he made in DC. It's over his shoulder, he takes a touch, he takes another touch, it's incredible. But I think that he's a talented player. And when have you a will to win, that's strong. So he makes a play a few weeks ago, sliding on the end line, pulling across. He just has a will to win. He's a philosophy player. He plays against the ball and runs and chases and tactically understands. He teaches, he does a lot of the intangibles. But to see him make that play, it's not that surprising to see him make it because we see it in training regularly. So nothing much I'm telling him, it's all him."